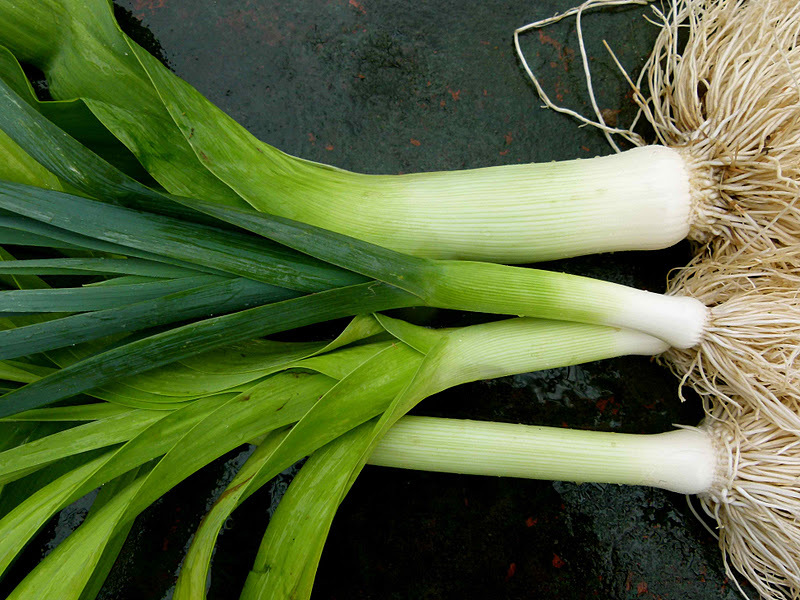 Leeks are my bona fida winter vegetable. 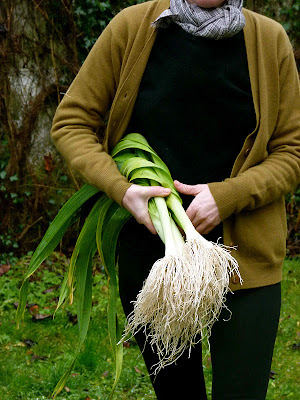 Now that the rest of the garden has collapsed into a brown, rotting mess of stems and root after those first frosts, my hardy leeks are still upright and hanging on, proud and green against the dullness of winter. Right now I need an industrial crane to extract them from the rock-hard soil. 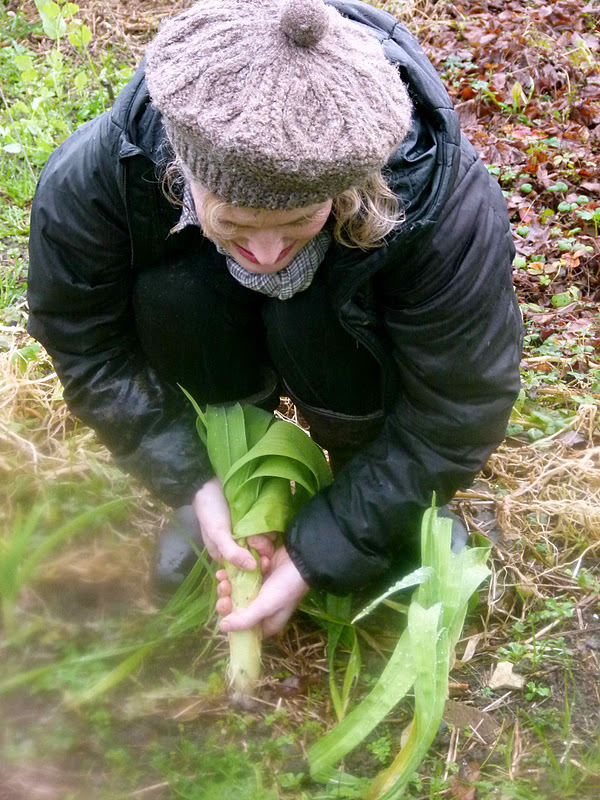 Armed with the right tools and covered from head to toe in pillowed plastic to protect myself against the rain torrents, I spent a good hour this morning pulling five leeks, one by one just to get the lunchtime soup on the table. They were delicious with potatoes, cream and chives as we huddled before the fire. On our return from Ireland yesterday evening, Mailhos was bathed in rain outside and less than 12°C inside. By late evening, after the stove was lit and fireplace raging, temperatures had risen to 13° and we were forced to early bed, wearing woollen bonnets and scarves. I'm the kind of girl who dislikes heated sleeping spaces but last night was beyond cold. I was woken by my nose actually freezing or so cold that there was no more blood circulating within. Temperatures can vary from room to room in Mailhos but I suppose no matter how hard I try, I will never make a good Inuit - I neither have the blubber beneath the skin nor the wish to endure. This morning we woke to a warmer living space and leek soup has animated our bones and muscles. Temperatures are now reaching a decent 16° and we are both content. 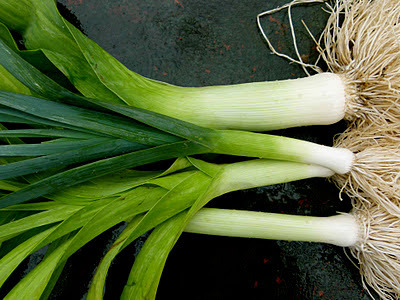 ... so back to leeks! I love them in soup but also just gently cooked with a little butter and never burnt before serving with almost anything. I add them to fish pie with some cod or pollack or soak them in a traditional wine vinaigrette after steaming. They can also replace onions in any dish that calls for the red ones as they possess the same sweetness but most importantly they don't make you cry. Preheat a grill or an oven to 200°/6. 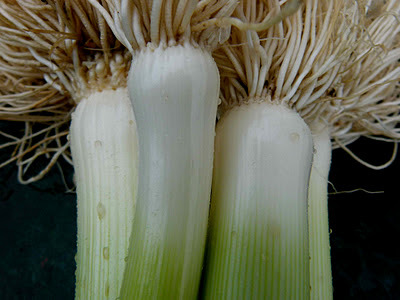 Cut off the green tops of the leeks and slice the white parts into thin rounds. Soak in a little water to remove any soil or sand. Trim the thick stalks from the borage leaves and chop coarsely. 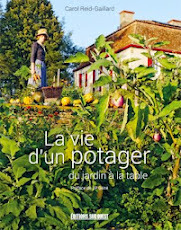 Boil a small frying pan of water with a pinch of salt and add the borage leave. Cook for one minute or until slightly wilted. Drain and shake out the excess moisture. In a thick-bottomed saute pan, heat the butter and a tablespoon of olive oil. 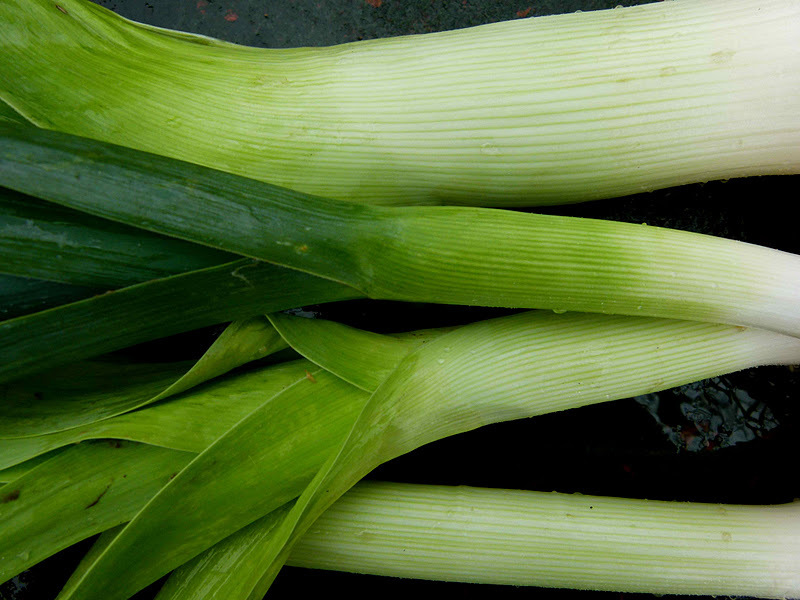 Add the leeks and cook for about 8 minutes or until transparent and tender. Add the borage leaves and mix well together. Cook gently for another minute. Remove from the heat and leave to cool in a separate bowl. When the vegetable have cooled down, add the eggs, garlic, herbs, cheese, breadcrumbs and season well. Mix well together. Add another 2 tablespoons of olive oil to the saute pan and place on the heat. Add the egg mixture and cook over a gentle heat, stirring the mixture as the curds form. Stop mixing and leave to cook slowly until all but the top is cooked. Place under the hot grill or in the oven and leave just until the top starts to turn golden brown. Remove from the heat. Leave to rest 1 minute and then place a plate over the pan and turn the frittata into the plate. Cut into wedges and serve warmish. Rest in Peace dear Caty the chicken who was swooped up by a hen harrier in our absence. As she was blinded by her dutch designed feather headdress, she probably saw nothing of the impending disaster. May her next life be visible and calm! Thank you for giving me an idea on what to do with all that borage in the garden ! Will we be blessed with a borage post on of these days??? 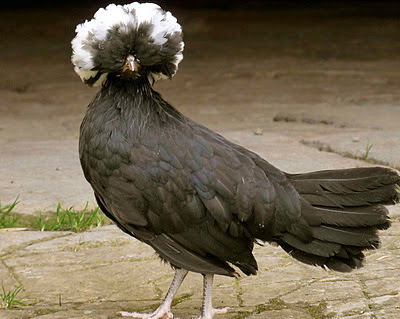 I can see my silkie hen may come to the same fate with the local sparrow hawk. She can't see a thing. I might give her a hair-cut [feather-cut?] actually. Oh the joys of winter... chilblains & draughty halls & birds of prey circling overhead! 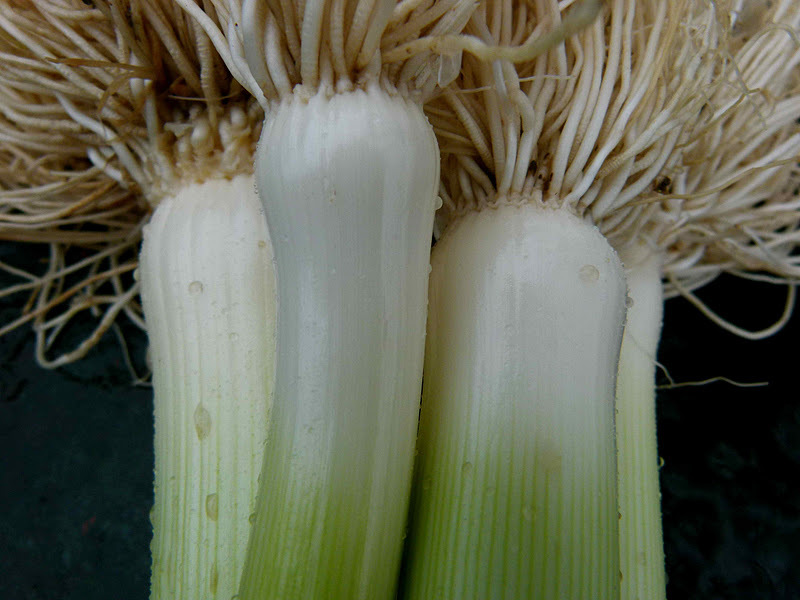 At least there are the gorgeous leeks! 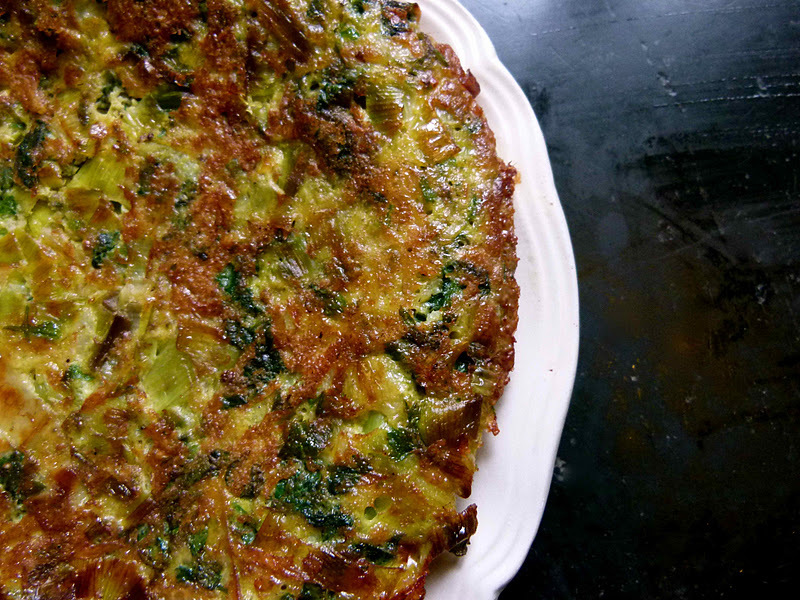 I love them in salt cod soup but your frittata recipe sounds scrumptious, must try soon. Here's to decadently dangerous headresses, I think the Duchess of Windsor had one just like it! My garden has grown a curtain of borage to smother the weeds in the garden. I could almost do an open day of borage picking for you locals but I'm sure you've got just as much. Borage post??? Why not? 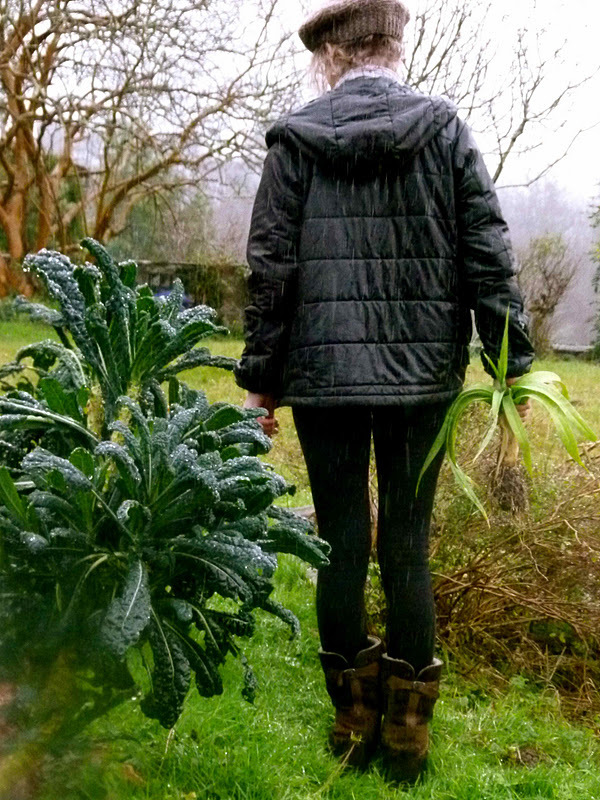 The garden produce is becoming somewhat scarce! I tried the feather cut in Caty's earlier life and it didn't make much difference! I really think she just had bad eyesight! But the Duchess of WIndsor had the eyesight of a hawk! No headress could get in her way!